I've been meaning to talk about this Tablet for a while and I think seeing how it releases on November 15th, it's about time I do it. Lets start off however with a little bit of History. As we all know, Apple made the current tablet system we have now popular with it's iPad. Ever since then all these companies have been trying to make an iPad killer. Just that tablet that will make people say "I want that instead". And just like with the cell phone market, these companies have looked towards Google and Android to help them with this vision. The biggest problem in my opinion is not that these tablets they are making are not good, I have a Motorola Xoom and I love it. I think the real problem is that they keep wanting to make as much money off them as Apple does. I feel the main purpose of a tablet is to read emails, browse the web, maybe read some books and play a few movies. And the iPad does all this just fine. So when I'm trying to tell people why an Android powered tablet is better for them, it makes it a lot more difficult when the option I'm presenting costs as much as the option the media has been telling them to get. You can not try to fight Apples marketing department with a product that costs the same. Now, int he past there have been a lot of Android powered tablets out there that were cheap, brought to us by companies like Archos. But it's hard for me to recommend such devices because I'm not even sure where to go buy them myself. Not only that, but I used to have an Archos Internet Tablet and the updates were always so behind where everything else was. They also tend to get abandoned pretty quickly. On November 15th however here comes Amazon with the Kindle Fire! This is a 7 inch tablet. So it's not the bigger 10" that we are so used to seeing. But I've found 7" to be just great for most basic tablet uses. I actually feel that my 10" gets a bit heavy at times. . . . and now this is starting to sound really bad. . . . This tablet comes with a very nice screen similar to the one on the iPad, so you'll be able to really enjoy magazines and movies. It runs Android but it runs a totally modified for Amazon android. This tablet will not look like any other Android device out there. You also get free cloud storage in the Amazon cloud, so you can use services like the Amazon MP3 Streaming, or just keep your books in the cloud. You also get 8GB of actual storage to keep any MP3s you want to keep in the device or books or movies. You have access to Amazon Prime, which is like Amazon's Netflix service that allows you to stream movies or TV shows. Lacking a little but for $75 a year it's worth it. With an Amazon Prime account you also get free 2 day shipping on most items. Don't forget that Amazon is mostly a bookstore so there will be plenty of books to chose from. There is also the Amazon App Store for Android. Since I said this was a VERY customized version of Android, there will be no signs of Google here. So you will not be seeing an Android Market. Instead you'll get your apps from the Amazon App Store for Android. Which has all the apps you could possibly want along with the Daily free paid app. Basically every day they have a new paid app that they are giving away for free. If you don't have the amazon app store for android on your regular android device, I'd go ahead and get it, because it's actually kind of fun to see what surprise you'll find when you wake up and check what the free app is. Sure, most of the time it's crap, but every now and then there will be something pretty awesome. Once you download a free app, it's yours for ever. So if you delete it, you can still install it again later. The Kindle Fire also has a dual core processor, so this thing runs pretty fast. It also has a new kind of browser technology where the Amazon servers do most of the hard work for the browser, allowing web pages to run faster. Honestly I have no idea how good that is. 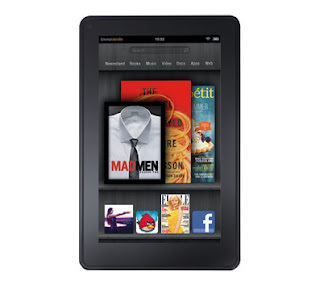 So what is so special about this Amazon Kindle Fire that I have to write this post about it? The Price. The Amazon Kindle Fire price is $199. Paying $499 for a table that we'll probably only use for email and some web browsing may be too much for a lot of people. But at $199, the Kindle Fire does start to look a lot more interesting. Keep in mind, this is certainly not going to be a tablet for heavy users. You wont be able to take pictures with it, which no one really does with their tablets anyway, but a front facing VGA camera would have been nice, at least you'd be able to skype with people. But if you are just looking for a device to check emails, browse the web, look at pictures, listen to music, watch some movies, play some games or read some books with, then this is certainly something to think about. STUFF: Do we think for ourselves?